I was initially so heartbroken over the fact that I didn’t get this book on it’s first day of release because well, I don’t have money to buy the book. 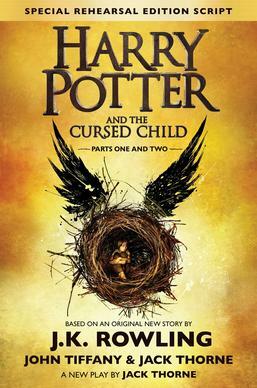 As a Potterhead, I felt like I should have this book and I MUST READ it. But I have priorities and a 1500php book is not on it. So I let it pass. Until a friend gave me copy which I gladly accepted and read. I hate this book. I’m so glad I didn’t shell out 1500php because honestly, I’d probably cry. I told you I am a Potter head. I read all the books like a thousand times already and listened to the e-book, everyday, for the past 6years. That’s my “work-mode music”. I have it on my office laptop and I have to listen to it to function properly at work. Anyway, it took me such a long time to finish reading this book because I really don’t like it. It doesn’t feel like Harry Potter at all. The characters are far from the characters I grew up reading. I kept on telling myself that this is not the Harry, Ron and Hermione that I know. They made Harry this pathetic father, Ron turned out to be a comic father without much depth. Only Hermione turned out to be close to the Hermione that I know but still. Na-ah. If there’s one saving grace, it’s probably the Malfoys. Sila lang talaga. Sila lang talaga yung okay. If you are a Potter head like me, I suggest don’t read it anymore. It’s so sad. Nainis talaga ako ng bongga. I almost didn't finish reading it. Umandar lang talaga ang pagiging bookworm ko kaya tinapos ko sya ng pilit na pilit.